SEPT 26, 2012 (WEDNESDAY) – Hollywood A-list movie star Zac Efron (The Lucky One, 17 Again, High School Musical series) arrived in the Philippines today from Los Angeles, CA. Zac reportedly flew in with his father David Efron, manager Jason Barrett, and Hollywood photographer Darren Tieste for a brief holiday at Misibis Bay Resorts as personal guests of Bicolano tycoon Zaldy Co. 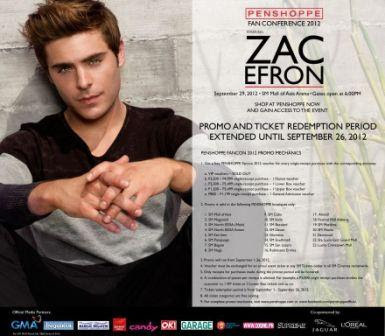 He is scheduled to appear before a huge crowd of fans on September 29, 2012 at the Mall of Asia ARENA for the event PENSHOPPE Fan Conference 2012. In recent years Zac continues to add impressive movie roles under his belt, with each project getting more challenging each time. Since his early days doing musical flicks, he has crossed over to light romantic comedies (17 Again, New Year’s Day), to more dramatic and mature roles (Charlie St. Cloud and The Lucky One). More recently, he starred alongside heavyweights Matthew McConaughey, John Cusack and Nicole Kidman in the period drama The Paperboy, and was recently at the Toronto International Film Festival for the film At Any Price with Dennis Quaid. The star shows sincere excitement as he visits the country for the first time. “Well, first of all this trip is an amazing, amazing excuse to go to the Philippines. I have always wanted to visit the Philippines. My dad who has been to your country several times has been telling me great stories about it,” he shares. Tune in to GMA-7 and GMA News TV Channel 11 for more updates on Zac Efron's first trip to the Philippines.